Is Morocco Immune to Upheaval? The uprisings that swept across the Middle East and North Africa during 2011 have largely bypassed Morocco. The absence of tumult and the loudly trumpeted package of constitutional reform measures endorsed in a July 2011 national referendum further strengthened Morocco's favorable image in the West as a country that has mixed tradition with modernity and an openness to foreign cultures, and which is both politically stable and steadily evolving toward greater pluralism. 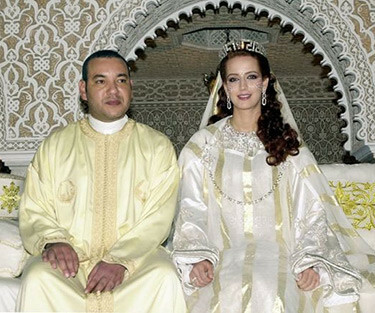 Many hoped that Morocco's King Mohammed VI, here with his wife Princess Lalla Salma, would move toward establishing a Spanish-style constitutional monarchy. Although the ruler has been open to reforms, those undertaken have been put into effect at a leisurely pace. Recent events in other North African states have given him a more urgent impetus to address his country's many problems. Morocco's success in having thus far dodged upheaval warrants explanation for the country suffers from many of the same underlying ills that have driven the protests elsewhere—corruption, poverty, and unemployment; the overwhelming concentration of wealth in the hands of a small stratum of elite families intertwined with the authorities; the absence of real democracy; and closed horizons for its large, youthful population, suffering from disproportionately high rates of unemployment and underemployment. But Morocco's starting point, in terms of its political institutions and political culture, is different in ways that provide some comparative advantages. Moreover, unlike other Middle East, autocratic regimes during this tumultuous year of popular intifadas, the Moroccan authorities, led by King Mohammed VI, have been sufficiently proactive in their responses to the rumblings from below so as to render them manageable, at least for the time being. A closer look at state-society dynamics in Morocco during 2011, against the backdrop of the country's deeper currents, reveals the extent and limits of Moroccan exceptionalism. The country possesses considerable assets: a political and societal center within a distinct geographical core stretching back more than 1,200 years; a ruling dynasty more than 350 years old whose legitimacy is based on claimed descent from the Prophet Muhammad; religious homogeneity of 98 percent Sunni Islam; and a particular material and popular culture, modes of religious practice, and linguistic configuration, much of which stems from Morocco's large Berber population (approximately 40 percent of the total) and heritage. Of course, these factors alone cannot be said to provide immunity to social and political upheaval. If anything, Tunisia and Egypt both possess an even greater degree of social and political cohesion, which did not prevent the latest revolutions there. Is it the legitimacy provided by Morocco's monarchical institution that explains the lack of a massive, popular uprising thus far? To even suggest so would have been ridiculed a generation ago. Morocco in the 1960s and 1970s was wracked by political instability and attempted coups d'état. But by the 1990s, Middle East monarchies began to be viewed in a more favorable light as resilient institutions that often functioned as vital social and political anchors in times of rapid change. Moreover, the last years of Morocco's late King Hassan's 38-year reign (d. 1999) were marked by what he liked to call "homeopathic democracy," namely, measured, incremental steps toward political liberalization. However numbingly slow, it eventually resulted in the ending of some of Morocco's most notorious human rights abuses, an expansion of the space for civil society organizations, and an agreement by opposition political parties to reenter the political game. Liberal circles hoped that Hassan's son and successor, Mohammed VI, would move toward establishing a Spanish-style constitutional monarchy, à la King Juan Carlos. Although this did not occur, the new king moved quickly to make Morocco a significantly more relaxed place, politically, socially, and culturally by combining economic modernization, political liberalization, expanded social welfare, and a tolerant Islam that employed the tools of reason sanctioned by Islamic law on behalf of the general good. These measures stood in sharp contrast to the political stagnation and retrogression that marked the Tunisian and Egyptian political landscapes and, thus, set the stage for their 2011 revolutions. Part of Mohammed VI's ruling formula was to allow a certain degree of Islamist political activity. The Party for Justice and Development, an Islamist party that was first brought onto the scene by his father in 1997, was allowed to grow into one of the leading political parties in Morocco's fragmented political system (no party holds more than 14 percent of the seats in parliament, rendering them malleable for co-option into coalition governments dominated by the palace). Another part of the new king's strategy was to balance Islamist and conservative forces by strengthening the country's liberal current. The centerpiece of his approach was the scrapping of the country's long-standing, Islamic-based Personal Status Code in favor of a new family law in 2003-04, which brought women significantly closer to legal equality with men. Liberalizing public life also included the establishment of a truth and reconciliation commission, an unprecedented act in the region, which enabled public acknowledgment of the abuses committed by his father's minions. In addition, the palace embraced and legitimized the increasingly visible Amazigh (Berber) culture movement as an integral part of the Moroccan fabric. Real power in the kingdom, however, stayed in the hands of the palace and its affiliate circles while parliament remained emasculated and political parties mainly competed for the patronage the king was willing to bestow. Moreover, the security forces' response to the 2003 Casablanca suicide bombings and subsequent smaller incidents of homegrown terror called the regime's professed commitment to human rights into question as did the incarceration of Sahrawi (Saharan) activists challenging Morocco's control of the Western Sahara. In addition, the country regressed in terms of press freedom and human rights. Finally, by the end of the decade, a new political party, Authenticity and Modernity (PAM), headed by one of the king's close associates, Fouad Ali Himma, appeared on the scene, apparently being groomed for power and thus rendering empty the promise of genuine political liberalization. Alongside this, economic growth failed to reduce the high rate of unemployment while the illiteracy rate remained over 40 percent. The events in Tunisia and Egypt at the beginning of 2011 were keenly watched in Morocco. Like-minded Facebook protest groups quickly sprang up among Morocco's Internet-savvy, mostly politically unaffiliated twenty-something generation. Unlike their counterparts to the east, their target was not the "regime," i.e., the monarch, but the corrupt elites who benefited from the existing state of affairs. A more poignant type of emulation came in the form of a number of self-immolations, following the lead of 26-year old Mohamed Bouazizi, whose ultimately fatal act triggered the overthrow of Tunisia's president. At least two of these Moroccans died from their burns. Fadwa Laroui, a poverty-stricken, single mother of two who lost her shantytown home to builders, was unable to acquire government allocated land because as a single mother she was not "the head" of a household. She set herself on fire after repeated complaints to local officials proved useless and recorded her last words on a cell phone camera, which were later uploaded to YouTube. Would her sacrifice, she wondered, inspire people to "take a stand against injustice, corruption, and tyranny?" By mid-February, the atmosphere became increasingly charged, and the Moroccan protest movement gained a bit more form with the establishment of the "February 20th Movement," a cross-section of young activists running the gamut from previously unaffiliated Facebook users, members of Amazigh associations and various leftist groups, to members of the officially banned but reluctantly tolerated Islamist movement, al-Adl wa'l-Ihsan (Justice and Benevolence). Its inaugural February 20 protests sent tens of thousands of demonstrators into the streets across the country and were followed by smaller, ongoing, weekly protests. The atmosphere on that day was mostly festive as participants called for bringing the country's political and moneyed elite to account: Prime Minister Abba al-Fassi, PAM's Himma, and Mounir Majidi, the king's private secretary, who oversees royal business interests, were particularly targeted with corruption allegations. Amazigh activists, for their part, prominently displayed their movement's flag and advocated full linguistic and cultural recognition within a genuinely democratic state. The most delicate subject, of course, was the king's status; slogans calling for a "parliamentary monarchy" indicated that the protesters sought a clearer, more limited definition of the king's sweeping powers in favor of their elected representatives. While mild compared to upheavals in the rest of the region, the February protests raised the specter of Morocco going down the same road as so many other Arab states and unnerved the authorities. From the beginning, and right through the first half of 2011, the government adopted a multi-pronged strategy: proactive measures designed to appease popular frustration with economic conditions (e.g., increasing state subsidies on basic goods, raising salaries for civil servants, promising government jobs for recent university graduates); proclaiming the right of peaceful protests to go forward while simultaneously working to discredit the protesters; and using occasional police violence to intimidate demonstrators. Most importantly, though, was Mohammed VI's very public promise of sweeping reforms in an effort to quell the protests. Speaking to the nation on March 9, the king outlined what he called "a package of comprehensive constitutional amendments," centering on the strengthening of the powers of the government and the parliament. Details were to be worked out over the following three months by a blue-ribbon commission headed by 67-year old Abdellatif Mennouni, a constitutional law expert and veteran of Moroccan public affairs, with the changes to be submitted to the public for approval by referendum. In so doing, the palace gained control of the public discourse of reform, enabling it to manage it better and to contain the currents of unrest. Ironically, but not surprisingly, even as the proposed reform package trumpeted the strengthening of political institutions and the implied devolution of some powers by the monarchy, the political parties themselves were, as usual, relegated to secondary status: Their assigned role was essentially to endorse the final text after a brief consultation with the king's advisers and then to offer revisions to the commission's recommendations. An analysis of the new constitution reveals that while the powers of the prime minister and parliament were somewhat enhanced—the prime minister would henceforth be called the president of the government and chosen from the party that won the greatest number of seats in parliament—preponderant power remained in the hands of the king. While no longer defined as "sacred," he remained the amir al-mu'minin (commander of the faithful), both the religious and political head of the state, the symbol of the nation's unity, guarantor of the state's existence, supreme arbiter between institutions, and personally beyond reproach. A comparison between the commission's draft text and the final version illustrates the thinking of those who want to transform Morocco into a more genuine constitutional monarchy with liberal democratic underpinnings and the obstacles they face. To be sure, the final version contained specific language emphasizing a commitment to an independent judiciary, the protection of human rights, and the ensuring of equality between women and men. Nonetheless, the commission's draft was considerably more explicit in emphasizing liberal, universal values as underpinnings of the Moroccan state while downplaying the state's Islamic and Arab components. These initial, more liberal formulations were altered in the final version. For example, clause two of the draft preamble declared Morocco to be a "unitary sovereign state"; the final version replaced "unitary" with "Muslim," and the country's Arab-Islamic heritage was now referred to explicitly. In the same vein, the final version of clause three now included the goal of "deepening the sense of belonging to the Arab-Islamic umma [nation]." Article three of both the draft and final versions declared that Islam is the religion of the state but the draft version included stronger language guaranteeing the protection of religious freedom for all faiths. Clause two of article 25 in the draft constitution that guaranteed the "freedom of conscience" was dropped entirely. Similarly, with regard to the king's powers and prerogatives, the draft text implied certain limitations that were removed or substantially altered in the final version. For example, the final version added an additional article at the very beginning of the section treating the king's status, which restored the traditional emphasis on his being the religious as well as the political head of the community. As "commander of the faithful," he remained in charge of ensuring respect for Islam and would preside over the Higher Council of Ulema (religious jurists), responsible for all religious rulings (fatwas). The king's explicit right to dismiss government ministers, inserted in previous constitutions but not in the draft text of the new version, was also restored. Overall, the king would continue to be the supreme authority on just about everything of significance: defense, religion, government (he is officially the chairman of the Council of Ministers, with the prime minister filling that role only in his absence), justice (chairman of the Supreme Judicial Council) and security (president of a newly created National Security Council). Perhaps the most revolutionary aspect of the new Moroccan constitution was its explicit recognition of Tamazight, the language of the country's Berber-speaking populations, as an official language. Moreover, it required the passage of an "organic law" to translate that status into reality in education and other spheres of public life. It further emphasized that the Amazigh people and culture constituted an integral component of Moroccan identity, which had been forged over the course of history alongside the Arab-Islamic and Saharan-Hassanian components and enriched along the way by African, Andalusian, Hebraic, and Mediterranean currents. To be sure, some Amazigh activists failed to be excited by the new constitution. The language equalizing the status of Tamazight and Arabic had been more forceful in the commission's draft text. This confirmed their deeply-ingrained cynicism regarding the authorities' true intentions. For these activists, the constitutional upgrade was just the latest in a series of the state's pseudo-embrace of the Amazigh movement in order to co-opt and neutralize it. Nonetheless, from a broader perspective, the institutionalization of Tamazight, along with the explicit recognition of Amazigh identity as central to the Moroccan historical and social fabric, was nothing short of historic. The demand for official recognition has been the central tenet of their movement for decades, ever since its inception. Morocco would become the only North African state, and the only core Arab League member state, in which Arabic was not the sole official language. Having been disseminated, the adoption of the new constitution was now fast-tracked to adoption via a nation-wide referendum on July 1, just three weeks after its publication. The state mobilized considerable resources in its public campaign for a "Yes" vote and allowed almost no space, physical or in the media, for opponents of the new constitution. Not surprisingly, 98.5 percent of Moroccan voters (73 percent of those eligible) voted (according to official figures) affirmatively. While these numbers were surely inflated, they nonetheless indicate that the Moroccan authorities had, for the time being, gained control over the pace and manner of political change. Regarding the whole reform process cynically, the February 20th Movement sought to reenergize itself with a new round of protests beginning in mid-September. It had, however, clearly lost steam. Internally, divisions between secular activists and the increasingly visible and assertive members of the Islamist al-Adl wa'l-Ihsan were taking their toll, affecting the capacity to mobilize. More generally, Moroccan society, with an eye on the upheavals elsewhere in the region and with the Algerian horrors of the 1990s still fresh in its mind, appeared reluctant to rock the boat too hard. The bombing of a popular café in Marrakesh in mid-April by Islamist terrorists was, for many, a chilling reminder of the consequences of disorder and instability. Meanwhile, nationwide parliamentary elections, originally scheduled for fall 2012, were moved up to November 25, 2011. The electoral campaign was brief and marked by widespread apathy. Voter turnout throughout most of election day stood at a very low level, but according to state officials, the last two hours witnessed an uptick, and the overall turnout was announced at 45 percent, a modest improvement over the 2007 voter turnout of 37 percent. Analysts were quick to note that many millions of eligible voters were not even registered, lowering the overall percentage of participants by as much as 20 percent. In any case, the results followed the pattern elsewhere in the region. The legal Islamist Justice and Development Party (PJD) far outpaced all of its competitors, winning 107 of 395 seats in parliament (about 27 percent) of the total. Created in 1997, at the behest of the late King Hassan II who wanted to have an Islamist party that accepted the parameters of the monarchy-dominated, Moroccan political game, the PJD had already emerged as a top-tier player in previous national and local elections while remaining in the opposition. This left it largely untainted by the stigma of corruption that hovered over much of the Moroccan political class. Ideologically, the PJD claimed to view Turkey's ruling AKP as a model but, in fact, was closer to the Egyptian Muslim Brotherhood regarding its vision for society and its critique of Western civilization (and its unbridled opposition towards Israel's existence, as well). Its leading coalition partner was likely to be the conservative, Islam-centered Istiqlal (which won 60 seats), the party of outgoing Prime Minister Fassi, but other more centrist, pro-palace parties were likely to join as well (PAM, on the other hand, quickly announced that it would be in the opposition). Ironically, the palace could be satisfied with the outcome. The PJD's win seemed to indicate that the election had been conducted fairly (international observers concurred) and confirmed its commitment to pursuing reform. Whereas Abdellah Benkirane, the PJD's secretary-general and probable new prime minister, spoke loftily about a new era in which he would work to alleviate poverty and corruption, he was fully aware where the preponderant power continued to lie—in the palace. Still, a new, more uncertain era has been inaugurated, one that is sure to involve a higher level of contestation among competing political forces. Liberal, secular-minded forces will clearly find highly objectionable much of the PJD's program to Islamize society peacefully, notwithstanding Benkirane's reassurances that he would respect human rights and individual freedoms. Benkirane himself is the bête noire of the Amazigh movement. How all of this will play out remains to be seen. In any case, Morocco's new constitution reflects the country's dual and often contradictory nature—a hereditary, Islamic-based, absolute monarchy, ruling over a modernizing, multi-cultural, and politically pluralist social and political order. Mohamed VI has bought further time with his latest measures. But staying ahead of the rising curve of demands for more meaningful reform, which is likely to be based on some of the more potentially innovative language of the new constitution, will demand much skill and wisdom from the country's political elite, beginning with the king himself. Bruce Maddy-Weitzman, the Marcia Israel Principal Research Fellow at the Dayan Center of Tel Aviv University, is author of The Berber Identity Movement and the Challenge to North African States (University of Texas Press, 2011) and co-editor of Contemporary Morocco: State, Politics and Society under Mohammed VI (Routledge, 2012). National Public Radio, July 1, 2011; Al-Ahram Weekly (Cairo), July 7-13, 2011. Aboubakr Jamai, "Morocco: After the 'Benalization,' the 'Tunisation?'" bitterlemons-international, Jan. 27, 2011. Intifada (shaking off) is the term widely used in the Arab world for "uprising." Joseph Kostiner, "Introduction," in idem, ed., Middle Eastern Monarchies (Boulder and London: Lynne Rienner, 2000), pp. 1-12; Lisa Anderson, "Absolutism and the Resilience of Monarchy in the Middle East," Political Science Quarterly, no. 1, 1991, pp. 1-25; Michael Herb, All in the Family: Absolutism, Revolution, and Democracy in the Middle Eastern Monarchies (Albany: SUNY Press, 1999), pp. 1-18; Owen H. Kirby, "Want Democracy? Get a King," Middle East Quarterly, Dec. 2000, pp. 3-12. The Guardian (London), Oct. 12, 2003. For an account and critique of the process, see Susan Slymovics, The Performance of Human Rights in Morocco (Philadelphia: University of Pennsylvania Press, 2005). See, for example, "Morocco/Western Sahara," Amnesty International, London, accessed Oct. 6, 2011. See Paul Rivlin, "Morocco's Economy under Mohammed VI," in Bruce Maddy-Weitzman and Daniel Zisenwine, eds., Contemporary Morocco: State, Politics and Society under Mohammed VI (London: Routledge, forthcoming 2011). Rachel Newcomb, "One Moroccan Woman's Fiery Protest," The Huffington Post, Feb. 28, 2011. BBC News, Feb. 20, 2011. The Economist (London), Feb. 24, 2011. Al-Arabiya News (Dubai), May 16, 2011; "A Brave Feb. 20 Young Woman Featuring Selma Maarouf," Moroccans for Change, May 16, 2011. The New York Times, July 20, 2011. The text has not been published; the author obtained a copy from a commission member. For the French-language text of the new constitution, see Sidi Slimane City.com, Morocco, June 19, 2011. Ali Mrabat, "La nouvelle constitution octroie de nouveaux pouvoirs au roi," Demain online, Oct. 7, 2011. Jewish Telegraphic Agency (New York), July 6, 2011; Arab Reform Bulletin, Carnegie Endowment, Washington, D.C., July 6, 2011. Interviews with various Moroccan Amazigh activists, Rabat, al-Hoceima, Nador, Sept. 2011. Bruce Maddy-Weitzman, "Morocco's Berbers and Israel," Middle East Quarterly, Winter 2011, pp. 79-85. Non-Arab Somalia and ethnically-divided Sudan (which has just seen a part of its territory secede), Djibouti, and the Comoros Islands are excluded from the notion of "core" Arab states but are, nevertheless, Arab League members. Al-Arabiya News, July 2, 2011. The Guardian, Apr. 28, 2011. Related Topics: North Africa | Bruce Maddy-Weitzman | Winter 2012 MEQ receive the latest by email: subscribe to the free mef mailing list This text may be reposted or forwarded so long as it is presented as an integral whole with complete and accurate information provided about its author, date, place of publication, and original URL.